Justin Sullivan/GettyBoth Apple and Samsung could use more of this enthusiasm. 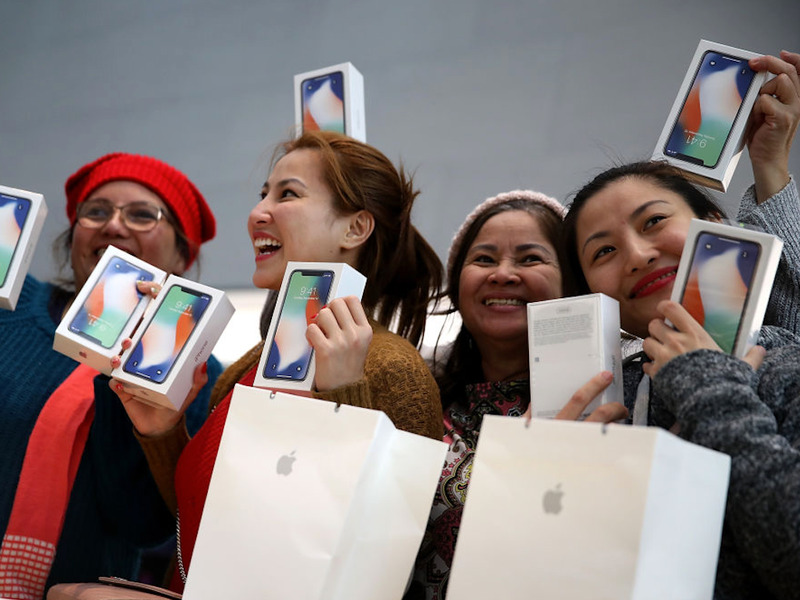 Fewer people are buying the $US1,000 iPhone X than expected. Apple is thought to have decided to produce fewer iPhone X phones as a result. That has affected suppliers that make parts for the iPhone X, according to a new report from Nikkei. Specifically Samsung, which supplies OLED screens for the iPhone X, is looking for other customers who may buy the tech. Samsung has been left with more OLED panels than it needs, but other potential customers have been slow to switch from traditional liquid crystal displays. Slowing demand for the expensive iPhone X isn’t just bad for Apple. A new report from Nikkei suggests that Samsung, which produces OLED screens for the iPhone X, is looking for new customers after Apple cut its production targets for the first three months of this year. Multiple reports in January suggested Apple halved its first-quarter production target to 20 million devices after lower-than-expected demand for the iPhone X. That has left Samsung, which makes the high-end OLED screens for the iPhone X, with too much product on its hands. According to Nikkei, Samsung ramped up production to meet the expected demand for the iPhone X. But that demand didn’t quite materialise, and now the firm needs to offload its excess OLED panels onto other customers. One problem is price. Samsung’s panels cost more than $US100 (£71) each, according to the report. Though the iPhone X’s OLED screen looks beautiful, it’s much more expensive than the liquid crystal displays used in other phones, including the lower-end iPhone 8 Plus. That’s partly why the iPhone X costs $US1,000 (or £1,000 in the UK) and why you won’t find many other phones on the market at that price. A related issue is that midrange smartphone manufacturers are avoiding adopting OLED screens because of their price, with makers reluctant to pass that cost on to consumers. Samsung is also facing more competition, with Chinese OLED makers able to offer the technology at a lower price. Apple’s lowered targets will probably hit Samsung’s bottom line substantially too. The firm was expected to earn $US4 billion (£2.8 billion) more from the iPhone X than from making components for its own Galaxy S8 smartphone, according to The Wall Street Journal.